Persistence Market Research presents a comprehensive and an accurately prepared report titled ‘Dental Lights Market: Global Industry Analysis 2012-2016 and Forecast 2017-2026’. This report tracks the global dental lights market and gives the forecast for this market for a period of nine years. LED dental lights are becoming increasingly popular presently due to their inherent benefits that include being environmental friendly, pocket friendly and also better operation wise. In order to understand the report in a better manner and for better organization of the report, this report on the global dental lights market is divided into four distinct parts. The first part of the report consists of the introduction section that has the executive summary of the report. This part also contains the market taxonomy and the definition of the product along with the market viewpoint. The second part of the report comprises the global dental lights market size and forecast by product type, end user and technology. This part of the report contains the important market numbers in the form of revenue comparison, market share comparison and year-on-year growth comparison. The third section of the report contains the regional assessment of the global dental lights market and the regions are chosen as per the market taxonomy. The last part of the report covers the competition landscape of the global dental lights market and has information on the key players operating in this market. The competition landscape includes detailed information on the important companies operating in the global dental lights market such as company description, product overview, key developments, strategic overview and key financials of each of the featured companies along with the SWOT analysis of the company. This competition landscape is a valuable part of the report as it contains all the necessary information required to study the leading companies operating in the global dental lights market in detail and also reveals how they implement their strategies and vision to stay at the top in this highly competitive market. Overall market size has been analyzed through historical data, primary responses, and public domain data. Revenue of companies in the dental lights market has been benchmarked to ascertain the market size for the base year. Macroeconomic indicators such as GDP and industry growth have been considered to forecast the market size over the forecast period. The historical growth trend of end-use industries, market participants’ performance, as well as the present macro-economic outlook has been taken into consideration for estimating the overall market trend forecast. This data is then validated using the triangulation method and is extensively scrutinized using advanced tools to garner quantitative and qualitative insights into the global dental lights market. The market taxonomy of the global dental lights market is presented to give a holistic picture about this market and ensure that all the segments and sub-segments of this market are properly represented. This market taxonomy also helps the report readers in understanding the full extent of the global dental lights market and helps in the logical interpretation of the market numbers presented in this report. Dental lights are used to deliver high quality illumination to dentists and provide a true image with a reduced shadow white light that helps them match shades, identify various details and also helps them in diagnosing tissues. Dental lights are in the form of both LED lights and halogen lights and come with various mounting configurations. Presently, LED lights are becoming popular with dentists due to the various benefits they possess. Besides being environmental friendly, LED lights are energy efficient and consume approximately 70 percent less energy than halogen lights. Also, LED lights remain cool while in operation and this poses no risk of burns and no risk of uncomfortable heat for the patients. As LED dental lights have a longer life, the total cost of ownership is reduced in LED lighting. In addition, LED lighting is consistent throughout, and hence there are no hotspots to be adjusted as is the case with halogen lights. In order to explore the market of dental lights more comprehensively, Persistence Market Research has delivered a detailed report that is full of valuable insights and covers all the important aspects related to the global dental lights market. The market for dental lights is covered keeping in mind all the important regional markets that are spread all over the world. The report on the global dental lights market contains a historical analysis of this market for a time period of 2012 till 2016. Additionally, the projections of this report on the dental lights market are based on a time span of nine years, starting from the year 2017 and ending in the year 2026. As per the report, the global dental lights market is slated to display a robust CAGR. The global dental lights market was estimated to be valued at nearly US$ 620 Mn in the year 2017 and is projected to reach a figure of nearly US$ 960 Mn by the end of the year 2026. The LED lights sub-segment in the product type category of the global dental lights market is likely to display a robust CAGR of 5.4% during the period of assessment. The LED lights sub-segment is the most attractive product type. As per the projections of Persistence Market Research, the LED lights sub-segment was estimated to be valued at nearly US$ 440 Mn by the end of the year 2017 and is anticipated to reach a figure of about US$ 700 Mn by the end of the year 2026. The halogen lights sub-segment is the second largest sub-segment by value in the product type category, and is projected to exhibit a CAGR of 3.7% during the period of assessment. 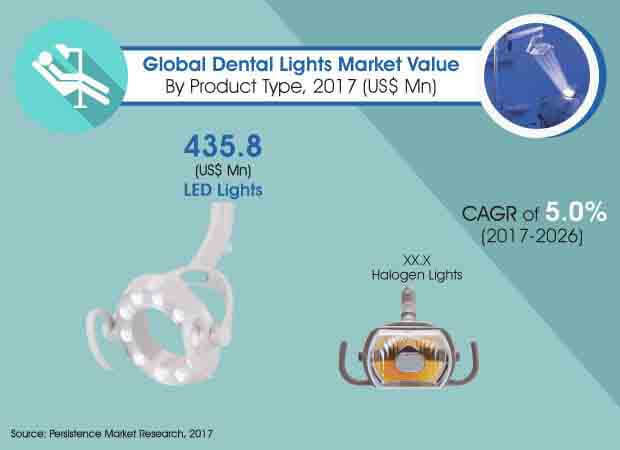 The halogen lights sub-segment in the global dental lights market was estimated to be valued at about US$ 180 Mn by 2017 end and as per the available projections, it is slated to reach a value of about US$ 250 Mn towards the close of the assessment period in the year 2026. Various important companies that are functioning in the global dental lights market have been profiled by Persistence Market Research in the competition landscape section of the report. Some of the companies that have been featured in the report include Danaher Corporation, A-dec (Austin Dental Equipment Company), Midmark Corp, Planmeca Oy, DentalEZ, Flight Dental Systems, TPC Advanced Technology and Dr. Mach GmbH & Co. KG.